C. White Marine contractors from Boston will do the work — expected to be complete next spring. Five years after Hurricane Sandy ravaged Squibnocket Beach, and more than two years after town voters agreed to back a complicated public/private partnership to provide access to Squibnocket Farm, work began this week on the private portion of the project. A 300-foot raised causeway will be built across marshland and beachfront to provide stable access to the farm, a private enclave of about 13 homes on a vast expanse of nearly 1,000 acres of rolling moors and beach. The causeway will replace the road that sits 10 feet above sea level and runs across the pebbly beachfront to the homes. The road washes out frequently during heavy storms. The area also includes a public town beach, marshland and a corner of Squibnocket Pond. 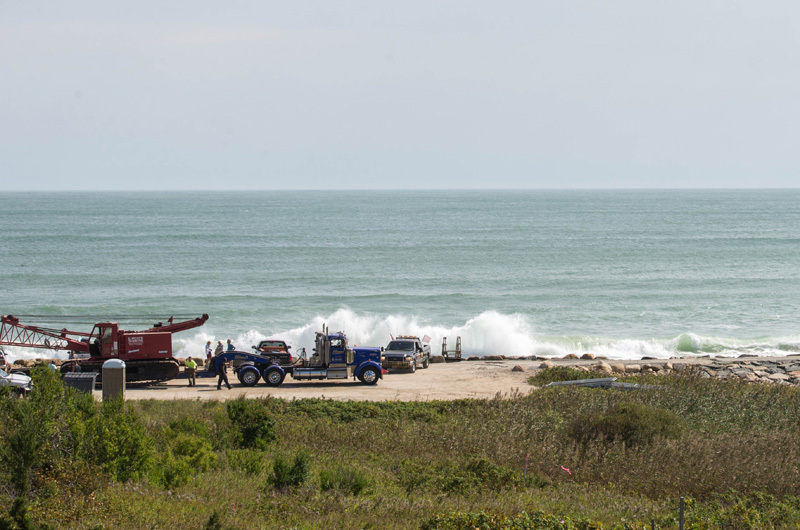 On Monday, Boston contractors C. White Marine moved a large crane onto the beachfront and began preliminary site work for driving support piles into the pristine marshland between the ocean and pond. The crane towered over the seascape, the sound of its idling diesel engine competing with the sound of waves crashing onto the severely eroded beach. Chain link fencing has gone up around the job site, marking off nearly half the damaged parking lot. Inside the fence are a steel storage trailer, a dumpster and a portable toilet. Despite several town votes in support of the project, it has deeply divided some residents and property owners over several years of contentious public meetings and court action. Mr. Spector said plans call for the new causeway to be complete by late spring. The homeowner association will pay the entire cost of the causeway. Mr. Spector declined to state the amount. In a related move, last week the homeowner association bought a roughly four-acre piece of beachfront from the Vineyard Open Land Foundation, the group that developed the former Hornblower property into Squibnocket Farm in the 1990s. The purchase price was $500,000. The Squibnocket homeowners will now lease the property, which includes about 1,250 feet of beachfront, to the town to significantly extend the public beach holdings on the western end. The 99-year lease has been signed, Mr. Spector said. In a 2014 presentation to town meeting voters, representatives of Squibnocket Farm outlined the design features of the new causeway to provide vehicle access to their homes. The straight, raised roadway will be about 300 feet long, sitting on steel pilings driven into the marsh. It would begin a short way up the hill from the current parking lot, crossing the expanse of marsh very near the shore of Squibnocket Pond, and ending just before the electronic gate leading to Squibnocket Farm. The bottom of the causeway will be 11 feet above sea level, while the road surface will be 13 feet above the ground. A railing would extend four feet above the driving surface on both sides. The design calls for a roadway driving surface 18.5 feet wide. It is designed to carry trucks up to 40 tons and withstand the force of floods and hurricanes. Chilmark selectmen are taking a mostly hands-off approach to the private part of the project, though they said they are pleased to see construction begin. Selectmen plan to put out a request for bids for the town part of the project on Friday. 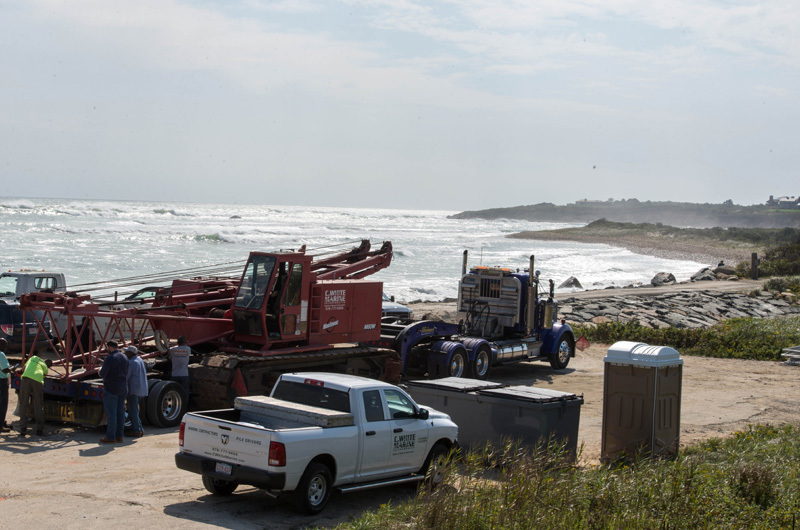 The town plans to remove the boulder revetment, relocate the parking lot and rebuild dunes to allow the beach to revert to a more natural state. “We need to point out that the committee on Squibnocket came out with a recommendation that was voted at town meeting, and that’s the plan we’ve been moving forward with,” said William Rossi, chairman of the board of selectmen. The cost of the town portion of the project is estimated at $267,400. Meanwhile, a neighbor group led by Blacksmith Valley resident Doug Liman has been attempting to block the project in court, to no avail. Last month the Massachusetts Land Court dismissed a complaint that sought to compel building inspector Leonard Jason Jr. to issue a building permit for the project. Mr. Jason has said that a building permit is not required under town bylaws for bridges and causeways. The land court judge agreed. The complaint was dismissed with prejudice, which means the litigants are barred from returning to the land court. Chilmark town counsel Ronald Rappaport said this week that Mr. Liman and David Stork, another property owner, have filed notice that they intend to appeal the ruling to the Massachusetts Court of Appeals. Mr. Rappaport said he sees no merit in the appeal, and at any rate it will not halt work on the project. Mr. Liman could not be reached for comment. Thomas Bena, a Chilmark resident and outspoken opponent of the project, said he hears from a surprising number of people who oppose the plans but are reluctant to step into the public fray. That aerial view includes very little of Squibnocket. Most of what is visible in the photo is Nashaquitsa and Menemsha Pond. Squibnocket, and the "1000 acres of rolling moors, dunes and beach", is out of frame to the left. 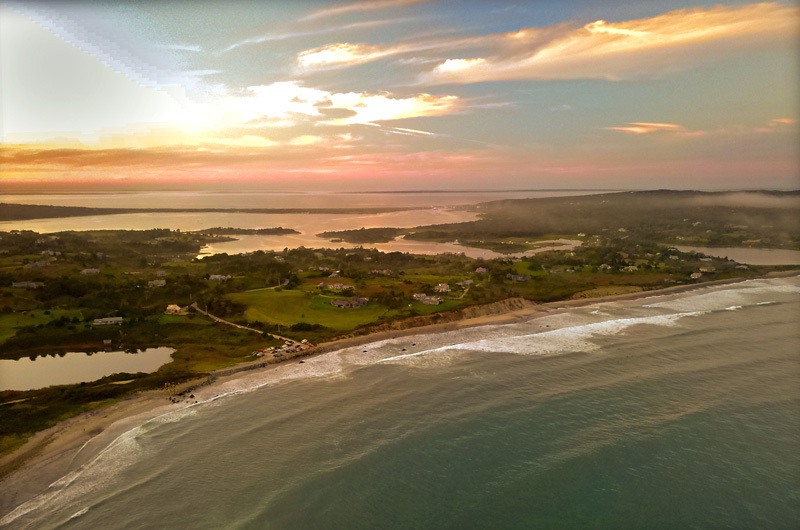 In any case, I am glad to see this project finally moving forward, as approved by a majority vote of the citizens of Chilmark, and in spite of the campaign of "alternative facts" spread by opponents of it. Just wait for the next super storm, Then what??? Mother nature has her way of taking control. Are we going to build a bigger bridge with more steel and concrete and fill in more of the wet land? As we all know some homes should never have been approved, but I guess that is why water front homes may just disappear when we least expect it. Good luck you are going to need it!!! Why mention filling in wetlands? It is not part of this plan. Also, there have been houses out toward Squibnocket ridge for centuries. At what point in time should any new houses have been denied? After the '38 hurricane, hurricane Carol, or hurricane Bob? The location of the road and cause way will actually be on a sandflat that was created by hurricane Bob. That entire area between the current parking lot and the pond is composed of sand that used to be on the beach. "Bob" busted out the previous road and pushed tons of beach sand into the pond. The main idea behind this project is to avoid what happened from Bob. Rather than a roadbed built upon solid ground, an elevated structure will be less prone to getting washed out, as the wave enrgy will pass above, below, and around it. This is what should have been done in 1992, after Bob. Terrible wrong turn for Martha's Vineyard. And Chilmark. Too many rich fat cats in Squibby. I think the Chilmark Selectmen did a great job throughout the duration of this effort to run an open and transparent process where the Town got to weigh in and vote. Democracy at its finest! If it didn’t go your way...stop whining. I respect all of those who think a bridge is a good idea but I firmly believe that building an immovable structure on a beach that is moving back each year, is a dumb idea. One day, in the not-so-distant future, you will walk out of the water and be under a bridge, instead of on a dune. If the engineers and consultants had been tasked with finding the best solution--instead of fighting for their clients wish to build a bridge--this would be an entirely different conversation.